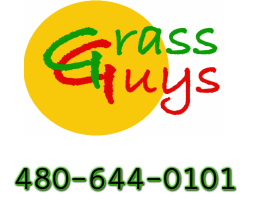 Winter Rye Grass Installation - Grass Guys, Inc. In the Phoenix metropolitan area there are two main types of grass, Bermuda, and Rye. Bermuda comes in many different types and hybrids and needs lots of heat and sun to grow making it great for Arizona summers. However, Bermuda goes dormant in the winter months ironically when the rest of us come outside to enjoy the great Arizona winters. At this time the rye grass is planted after prepping the lawn and grows throughout the winter providing a very nice deep green soft grass more familiar to those of you from the mid-west or northern areas. This grass dies out the following summer as the Bermuda comes out of dormancy in mid March-April, (an almost unnoticeable, natural transition). The rye will live though most of the summer however in areas the Bermuda will not live, shady areas under a tree for instance, helping keep your total lawn green and lush. Another benefit to planting rye is that the prep work needed to install the rye is great for the Bermuda the following spring and also helps keep the weeds down over the winter months as well as using about 1/4 of the water as in the summer. Rye also uses less than 25% of the water the Bermuda uses in the summer! • First we start by de-thatching your lawn. This pulls out all of the dead grass and undergrowth which not only helps your lawn “breathe”, but also encourages a better looking, flatter, more consistent summer lawn next year. For those customers who had service prior to the start of rye season, we dethatched your lawns in the summer to maximize the benefit to the bermuda. • Scalping the lawn. This process cuts the lawn very short removing most of the Bermuda grass providing a good planting area for the rye and helping the Bermuda go into dormancy. • Top quality Perennial Rye Seed and Starter Fertilizer. We spare no expense, we use only the best. We use perennial rye seed over annual rye seed because the perennial uses about half of the water and has a thinner, much nicer looking blade. • Sprinkler adjusting and repair. To ensure that your newly planted lawn grows in great we adjust and check any and all sprinklers. If a sprinkler is damaged and cannot be repaired we will replace it at cost ($3). Then we will adjust your timer or leave a note if we do not have access to your timer. • Cleaning up the mess. Because of the dethatching and scalping of the grass there will be a lot of lawn waste. Any extra lawn waste we will haul to the dump at no charge as part of your overseed. • Adding Seed and more Fertilizer. We don’t quit when the job is done, we come back and add seed and fertilize two weeks later to any areas that may have been ravished by birds or not properly watered due to a bad sprinkler. We want your business so we want your lawn looking great! Are you planning on planting rye grass this winter?